(NRA-ILA) – Gun ban advocates, knowing their goals aren’t especially popular with the American people, have in recent years tried to couch their agenda in more innocuous-sounding terms. They don’t want to ban all guns, they’ll say, they just want to keep them out of the wrong hands. But once you start paying close attention to their claims, you realize that the “wrong hands” might be closer and more numerous than you think … and might even include the more senior members of your family. Breitbart News recently pointed out that an “expert” who works at the Johns Hopkins Bloomberg School of Public Health (BSPH) is sounding the alarm about firearm possession amongst the elderly. Perhaps not coincidentally, that “expert” also claims that firearm ownership is most common in America for those aged 50 or older. One solution, the New America Media article suggests, is “competency tests for gun owners,” which would be similar to “requiring motorists to prove their proficiency behind the wheel as they grow older.” Another, according to Frattaroli, is allowing a concerned “loved one or neighbor” to obtain a court order to disarm gun owners whom the petitioner considers a risk to themselves or others. It takes a true gun control extremist to paint Grandma with the same brush as others who are categorically prohibited from possessing firearms, such as felons or those who are addicted to illegal drugs like heroin or methamphetamine. But lest gun control advocates like Dr. Frattaroli be accused of age discrimination, college students fair no better in their eyes. A spirited classroom discussion is likely to provoke murderous rage, they insist. And if academic debate doesn’t lead to homicide, they argue, binge drinking or other degenerate behavior surely will. What about adults with children? Shouldn’t someone responsible enough to oversee the well-being of another human being be responsible enough for possessing an inanimate object like a firearm? No, gun control advocates argue. The safest course is for them to forgo guns as well, because the children will find them. Perhaps single women, then? No, gun controllers will tell you, because they’re too weak to hold onto the gun and too incapable to use it if they do. They’d be better off with whistles to summon help. Even in an age of advanced political correctness, apparently no stereotype is too offensive to be employed in the pursuit of banning guns. 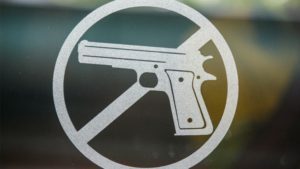 And when it comes to keeping firearms out of the hands of “dangerous people,” even the Bridge Club or the Shuffleboard League could prove just a little too high-risk to exercise their Second Amendment rights.